Duffle bags and sport bags for your team are guaranteed lowest prices & can ship today. Never underestimate the importance of your team duffle bags. This team essential helps you make sure you have everything you need to maximize your practice and games. So when it comes to your team sport bags, don’t go for ordinary. From the tote to a sport-specific bag with room for all your gear, discover the gym bag you need from Shop4teams. The latest duffle bags are available with a variety of materials, technologies and compartments. Today's duffle bags have come a long way from the classic drawstring style to include zip-top, rolling, and even waterproof bags. Below are just some of the types of duffle bags you can find on Shop4teams.com. All purpose duffle bags are the most basic and versatile duffle bags because they were designed with no specific sport in mind. They can be used for a multitude of uses including practices, games and traveling to tournaments. 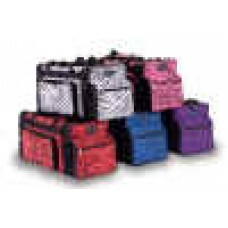 All purpose duffle bags generally have a large main compartment and little to no internal organization which allows you to be able to pack items inside without having to worry whether or not they will fit in the interior pockets. Gym duffle bags are great for use at the gym and at practices. Many gym duffle bags are also all-purpose, but some have handy features like water bottle pockets and shoe compartments. Some are even designed to fit inside gym lockers. Travel duffle bags are often mistaken for traditional luggage, but they typically offer more in the way of functional packing space. This style of bag is perfect for people who are traveling or are light packers that plan to carry on their luggage when traveling on an airplane. Travel duffle bags also make excellent overnight and weekend travel bags. Please note that additional shipping charges are incurred for duffle bags and will be added to your total after checkout. Your receipt that is e-mailed to you will reflect the correct total. 60% polyester/40% PPE glitter mesh fabric. 600-denier 100% polyester bottom. Tunnel drawstring and t..
70-denier nylon with PVC coating, 600-denier polyester with PVC coating. Hemmed top with drawcord cl.. Style # B100 Dimensions: 23" W x 11" H x 10" D Your all-in-one cheer travel bag 600D Polyester w/ He..
Pizzazz Zebra Print Multi-Sport Travel Bag Style # B200AP Dimensions: 23"W x 11"H x 10"D Zebra print..
Pizzazz® Small Duffel Bag Style # B300 Dimensions: 18" W x 9.5 H x 10" D 210D Polyester Featu..
Pizzazz® Zebra Print Small Duffel Bag Style # B400-AP Dimensions: 18" W x9.5" H x10" D Zebra prin.. Style # B500AP Dimensions: 23" W x 11" H x 10" D Zebra print design on 300D Polyester w/ Heavy Vinyl..
100% Polyester * Drawstring main compartment * Convertible mesh pouch stashes when not in use * Deco.. Constructed of 100% Polyester Heavy Denier with soft PVC Backing. Front zipper pocket with dee..